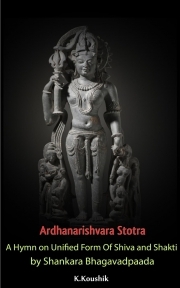 Description of "Ardhanarishvara Stotra (eBook)"
ardhanarishvara means the half feminine form of ishvara (Shiva) this form is a combined form of Shiva and Shakti. It is the union of Shiva and shakti and expresses their oneness.This is one of the most important forms of Shiva described in the shaivagamas, puranas, and mantra shastrasacharya Adishankara bhagavadpada composes this hymn to praise this particular form of Shiva. Worshiping this form is equivalent to worshiping Shiva and Shakti together.The kind acharya attaches two mantras in the ending verse of each shloka. The two mantras are the Shiva panchakshari (namah shivaya) and shakti panchakshari (namah shivayai) The hymn is an octet comprised of eight shlokas and one other shloka describing the benefits of reciting this hymn.In ardhanarishvara form of Shiva, one half is feminine and other half is masculine, hence acharya Adishankara bhagavadpada uses words denoting feminine gender for the feminine half and the words denoting masculine gender while referring the masculine half of the form.He uses both genders to refer this form. This is one of the most beautiful poetic hymns by acharya Adishankara bhagavadpada. He uses same words meaning differently in different contexts and similar words in this hymn n to praise the Shiva portion and the Shakti portion of this form.He doesnt only praise the differences (diversities) in the masculine and feminine aspects but also those attributes which are common and similar.This wonderful form is not a mere symbol of gender equality but the personification of universal spirit divided into masculine and feminine and the form reminds us the beauties and charms of each gender and shows us its completeness in a godly manner.Worshiping the lord in this form teaches us the art of love, compassion, and the sacredness of love, the highest spiritual truth of both the genders and the importance of both fierce and soft attributes and aspects of the lord.This form of the lord also teaches us how the men and women complete each other, make each other better, stay together with the diversities and similarities in them and complement each other.Whoever recites with devotion this octet which fulfills the desires is respected and has a long life on earth, he attains good fortune for limitless time and let there be always all kinds of success. A writer by passion as well as profession exploring inwards for peace, spirituality and outwards for technology and new things to learn. Reviews of "Ardhanarishvara Stotra (eBook)"